1 - Lumene Day Cream ($2.99) used $3.00 off any Lumene CRT = FREE! 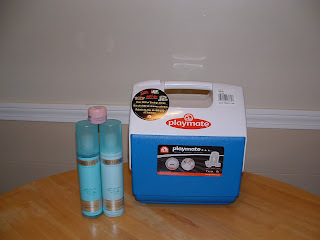 1- Playmate Cooler (Clearanced @ $3.75!) Can you believe we didn't have one?! * And there were two coupon books inside! *The funny thing is I almost bought that same cooler for $7.50 last week!!! :) Yay! your ECBs actually printed for the cristophe deal? i've done it four times and it wouldn't print! grrrr. i haven't tried in the past couple days though, maybe i should try it again.